The Cavaliers percussion section performs as part of PASIC in Indianapolis on Saturday, Nov. 16. 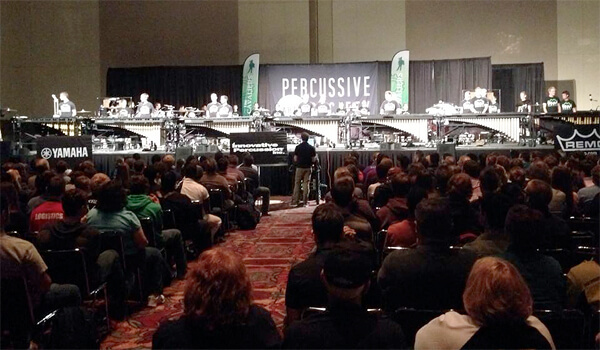 On Saturday, Nov. 16, the Cavaliers percussion section performed as part of an educational clinic at the Percussive Arts Society International Convention (PASIC) in Indianapolis. Thousands of percussionists from around the world attend this annual four-day event, which features exhibitions, educational clinics, concerts and workshops on every type of percussion imaginable. This was the first time the Cavaliers were featured as part of the convention since 1987. With a presentation titled "Inception to Implementation: Technology NOW!," Cavaliers staff members constructed the session to demonstrate some of the latest developments in writing for and teaching the use of amplification and electronics in marching percussion. Percussion caption head Michael McIntosh spoke glowingly of the benefits of amplification and electronics, how they're important to making a desired sound, and why that's loaded with educational merit. He said that the Cavaliers are working to be at the forefront of exploiting amplification and electronics on the football field. After the full line played an excerpt from the corps' 2013 production "Secret Society," Front ensemble arranger Alan Miller explained how the corps utilizes different mallets blended together to produce maximum depth and impact. He showed how multiple keyboards playing the same part simultaneously with different mallets in different ranges created a sound far more varied and interesting than multiple keyboards playing the same part with the same mallets. The corps also performed a selection from composer John Mackey's "Drum Music: Incinerate" first without electronics and then again with all the electronic sounds added to show how the electronic effects help provide the impact points in a drum corps show. After the corps' PASIC session corps director Adolph DeGrauwe said, "We're not just putting speakers in front of you to make it sound louder; the speakers enhance the product we're putting out." McIntosh echoed that sentiment in his closing remarks adding, "The use of electronics is never going to stop growing."